About me. My name is Mike Cunningham. 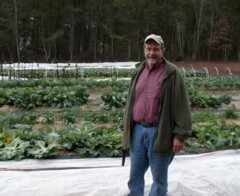 I am an Organic Farmer and Horticulturist from Newnan GA. I have an Associates Degree in Horticulture from Abraham Baldwin Agricultural College in Tifton GA. I have over 40 years of experience farming and managing a nursery. Along with my wife Judy and our four sons, we farm on land that has been in our family for 3 generations. Our garden is 2 acres and growing. Along with our garden, we have numerous pastures where we raise both beef cattle and milk cows, plus free range chickens. We sell raw milk, farm fresh eggs, grass fed beef, plus our garden produce at 4 locations each week. I have made numerous presentations to Garden Clubs, Master Gardeners and Professional Nursery Groups over my career. My wife Judy and I have a passion for teaching people to grow, cook and preserve good food.